This post was originally going to be titled "Two Ghanaian Projects You Should Support on Kickstarter" or something more interesting around those lines. It was going to be a call to support DUST Africa's and then Akosua Adomaa Owusu's projects they have put up on kickstarter. The title had to change because I found out while writing this that the former's funding had been cancelled due to an inability to reach their goal at the end of the set target of 15 days. Rather sad if you ask me. I love what they do at DUST and even had a subscription to the free magazine. I do hope they find a way to achieve their goals soon though. 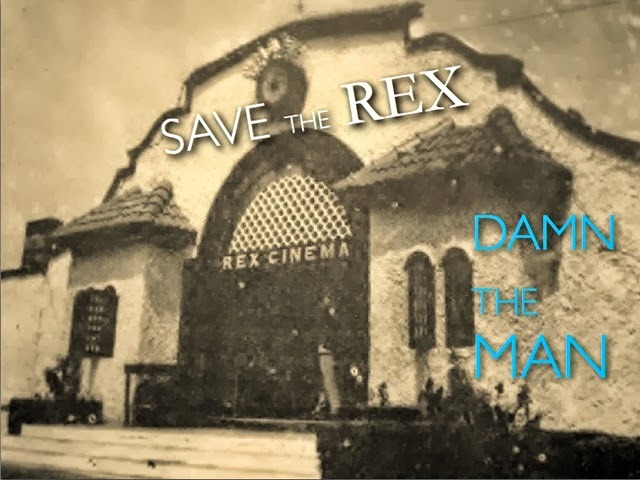 What you have to do right now is to support the move to Save The Rex. The 'why you should support Akosua Adoma's project' has been very well laid out by her on her kickstater page here. She's looking to raise $8000 revive The Rex Cinema. The other reason? Because the arts industry in Accra and Ghana needs places like Rex Cinema to function for it to go a step further. Have you ever thought of how boring Accra can get sometimes? (especially when you have to make a choice for a hangout or just an outing?) There are very few interesting things to do. With places like Rex Cinema functioning, there will be a wider variety of events to choose from and opportunities for young artists to show their work. Lest I forget. If this revival of the Rex doesn't happen it stands the chance been sold soon and been converted into a warehouse or some other business. You wouldn't want that? Would you? Let's cut the chase chale. Damn The Man, Save The Rex, if you can. OKAY! This morning, @DUSTAfrica replied my tweet. "There is no one place online where you can find reliable and current information written by the region's opinion leaders about current affairs, nor is there any place where pop culture gurus can go to find out what is bubbling in Africa's cultural pot."